Heat oven to 325°F. Grease springform pan, 9x2 1/2 inches, with shortening. In 2-quart heavy saucepan, heat 1 cup of the chocolate chunks and 1/2 cup butter over medium heat, stirring occasionally, until melted. Cool 5 minutes. Stir in flour until smooth. Stir in egg yolks until well blended. In large bowl, beat egg whites and cream of tartar with electric mixer on high speed until foamy. Beat in 1/2 cup granulated sugar, 1 tablespoon at a time, until soft peaks form. Fold about 1/4 of the egg whites into chocolate mixture; fold chocolate mixture into egg whites. Spread in pan. Sprinkle 2/3 cup chocolate chunks evenly over top. Bake 35 to 40 minutes or until toothpick inserted in center of cake comes out clean (top will appear dry and cracked). Cool 10 minutes. Remove side of pan; leave cake on pan bottom. Cool completely on wire rack. Just before serving, in 1-quart saucepan, heat 1/3 cup chocolate chunks, 3 tablespoons granulated sugar and the milk over medium heat, stirring constantly, until chocolate is melted and mixture boils. Remove from heat; stir in 1/2 teaspoon butter. In chilled small bowl, beat all Sweetened Whipped Cream ingredients with electric mixer on high speed until stiff peaks form. Place cake on serving plate. Drizzle servings of cake with sauce. Serve with whipped cream. Sprinkle with candies. 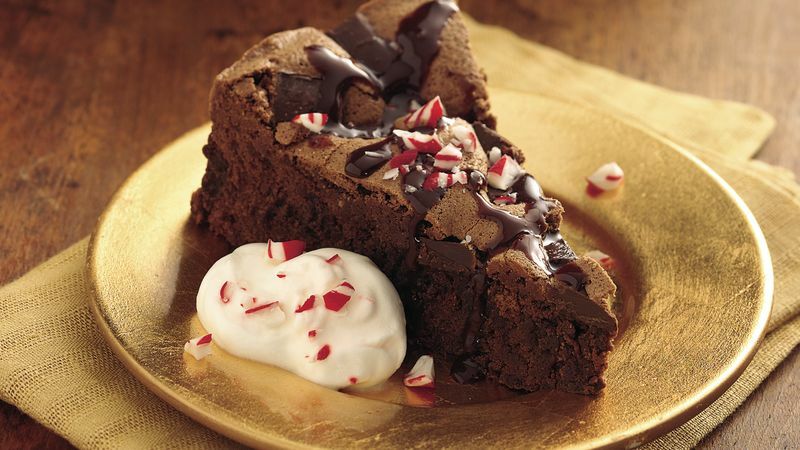 Instead of peppermint candies, use chopped toffee candy bars.